In the Hampden neighborhood, residents of 34th Street give Baltimore a treat every Christmas, decking out their homes with over-the-top holiday décor—hubcap Christmas trees, crabs pulling Santa’s sleigh, and thousands of colored bulbs. Lights even criss-cross the street, strung from rooftop to rooftop. 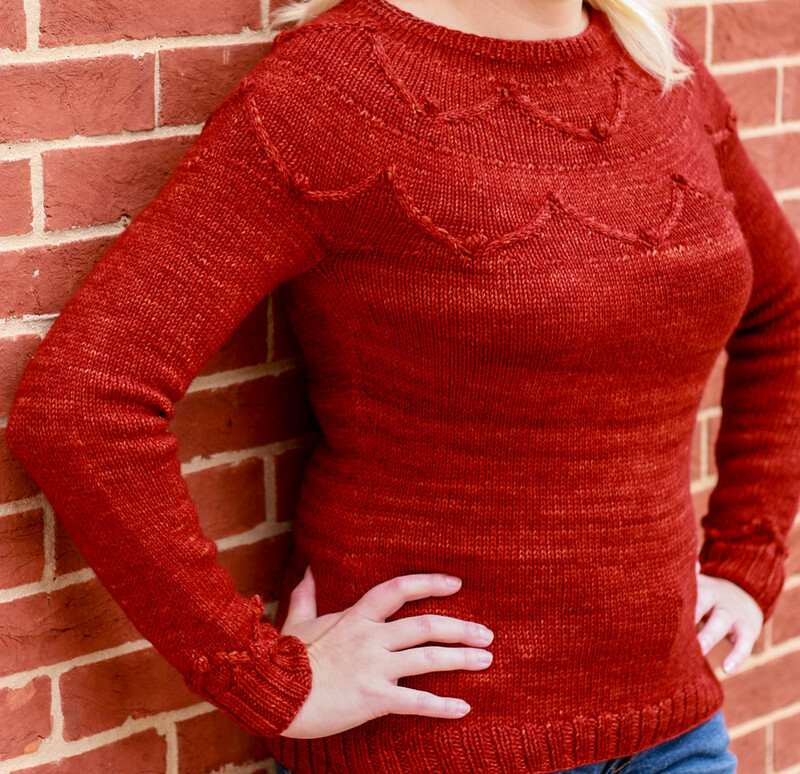 Inspired by this spectacle, cable strings and bobble lights drape across the yoke and cuffs of this sweater, which is otherwise worked in simple stockinette. Knit from the top down, it’s nearly seamless, and the pattern includes charts and written instructions. Knit in Dragonfly Fibers Traveller, a sturdy, warm superwash merino, it’s soft enough to wear right next to the skin. Sizes: XS (S, M, L, 1X, 2X); finished chest circumference 32 ¼, (36, 40, 44, 48, 52)”/82 (91 ½, 101 ½, 112, 122, 132) cm. Model is wearing size S with +1”/2 ½ cm ease. Yarn: Dragonfly Fibers Traveller, 100% superwash merino wool (280 yd/4 oz): 4 (4, 5, 6, 6, 7) skeins in Hidalgo.